We’re going to create a UIViewController subclass that displays a list of notes. 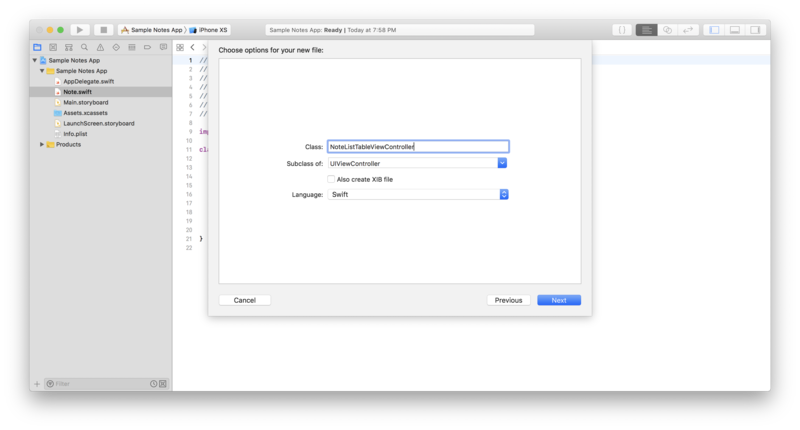 Bring up the template using File -> New -> File and choosing “Cocoa Touch Class”. 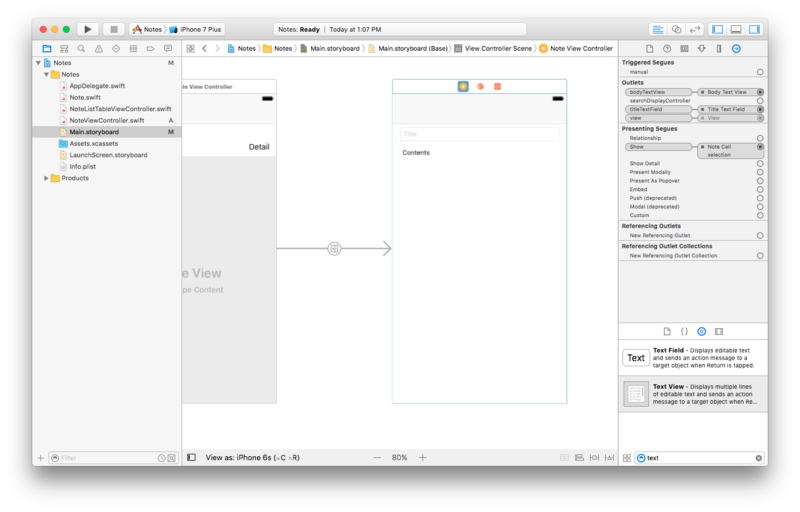 Tell Xcode to make the new NoteListTableViewController a subclass of UIViewController. Once the class has been created, go ahead and remove the didReceiveMemoryWarning() function. Don’t delete the viewDidLoad() and prepareForSegue() methods; they will be used later. Next we’re going to declare an outlet for our UITableView which we will connect in a minute. Declare the following variable just below the NoteListTableViewController declaration. Follow the same process above to create another View Controller subclass but call this one NoteViewController.swift. 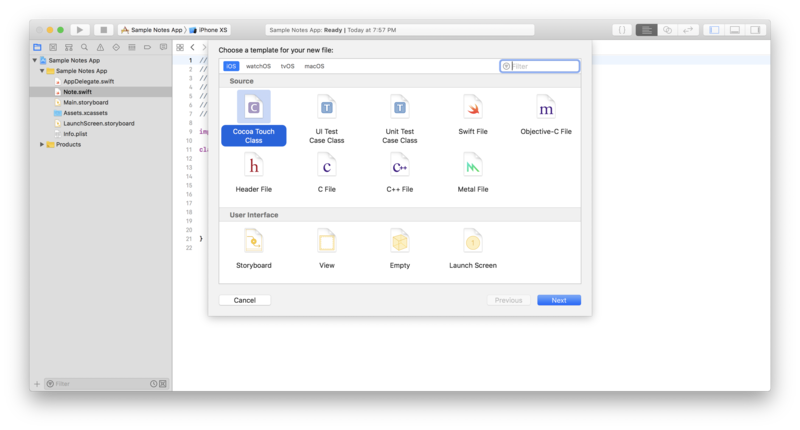 This screen will be responsible for displaying a Note and allowing the user to edit the title and body. Go ahead and replace all three template methods with two properties: a Text Field for the title and a Text View for the body. @IBOutlet weak var titleTextField: UITextField! @IBOutlet weak var bodyTextView: UITextView! Next we are going to design our UI (at this point we are assuming that you are familliar with Interface Builder and Autolayout). Drag out a View Controller scene and set the class to NoteListTableViewController. Embed the controller inside of a Navigation Controller by selecting the controller and then using Xcode -> Editor -> Embed In -> Navigation Controller. Use the attributes inspector to make the Navigation controller the initial view controller. Drag a Table View into our main view controller and use autolayout to completely fill the scene. Afterwards, connect the Table View to the controller’s tableView outlet. Drag a Table View Cell into the new Table View. In the Attributes Inspectory change the style to “Right Detail” and the Reuse Identifier to “Note Cell”. Drag out another View Controller scene and set the class to NoteViewController. Control+Drag from the Cell in the Note List Table View Controller to the Note View Controller to create a segue that will be triggered when the cell is tapped. Drag out a Text Field, set the placeholder to “Title”, and pin the left right and top constraints to the superview with standard spacing. We have created a Navigation Controller containing NoteListTableViewController and a tableview. Tapping the row will segue to NoteViewController which contains a Text Field and Text View.